The best protection against excessive sweating and odour. As claimed by many thousands of men, women and children all over the world. Try it today and discover a new zest and confidence for life. Wetness and odour problems? A thing of the past. Visible sweat patches, excessive odour, smelly footwear or clammy hands can be embarrassing issues that many people find hard to live with. Odaban products are highly effective and represent the simplest way to change your life. 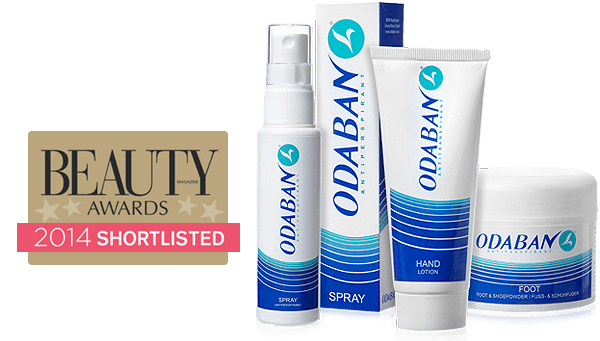 ODABAN® Spray is a safe and simple antiperspirant that protects against excessive sweating and odour, it is also suitable for use by sports-people and wearers of artificial limbs. Sweating is the body’s natural mechanism for controlling its temperature. Sweat evaporating from the skin cools the blood and this lowering of the blood’s temperature is used to help regulate the temperature of the other organs around the body. Real, unbiased feedback from our valued customers. An amazingly effective antiperspirant, for me Odaban lived upto it’s name. I’ve been using Odaban for over 20 years and it is absolutely superb. Just wanted to thank you for being so helpful, that’s so unsual these days. Odaban is amazing enough, but the personal customer service you offer is, dare I say it, even more amazing.